A big THANK YOU to all the ninjas that came out to participate in our First Annual DNC Paintball Wars this past Sunday. Despite numerous bruises and draining perhaps all my remaining life force for the day, I can say this was an awesome time! We got wrecked all day by professionals carrying automatic weapons and propane tanks on their backs but we walked away with the moral victory. Now we have until next year to amass arms! Props to Eddie, JR, Rich, Barry, Kim, Angela, Patrick, Eric P, Kris, Jess, and myself for being warriors today! Also, I want to recognize my awesome sister, Cristina Calimbas, and Barry Laminack’s dear wife Nora on passing their Nursing Clinical Exams this past month and officially attaining the title of Registered Nurse. Congratulations you two! Our friends at thecagedoor.net are hosting their second-ever UFC Watch Party for UFC 116 – Brock Lesnar vs. Shane Carwin. They recently formed their latest partnership with Big Woodrows and will be hosting this event there beginning at 7:30pm. For those of you that weren’t at their inaugural event, you guys missed a great time! And lots of great prizes! I personally won some pretty awesome MMA gloves from site sponsor Nine Dragon Martial Arts. 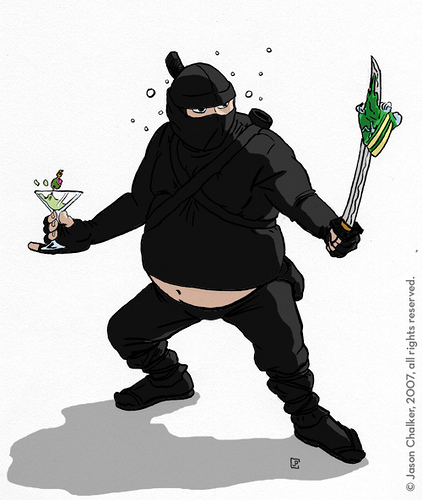 Maybe another ninja came win this time! DNC Worldwide will be participating as a seller for this event. For our ninjas in Houston, if you have any excess stuff (clothing, electronics, furniture, etc.) that you want to turn into cash for yourself or to donate to your favorite charity, you’re more than welcome to join us at Caroline Collective from 8am – 2pm. More info about this event here. Belinda Serrano of Elite MMA Baytown is organizing a blood drive in memory of her daughter, Vanessa, who passed away at 6-months old. Born on July 8, Vanessa would have been 17 years old this year. Belinda usually donates blood every year in honor of her daughter. Upon telling Vanessa’s story to the folks over at Elite MMA Baytown, the gym decided to contribute to her memory by hosting this blood drive last year and are doing it again on July 16th. Last year, they had 25 people donate and we want to help get even more people out there this year so this effort can help even more people who need it. 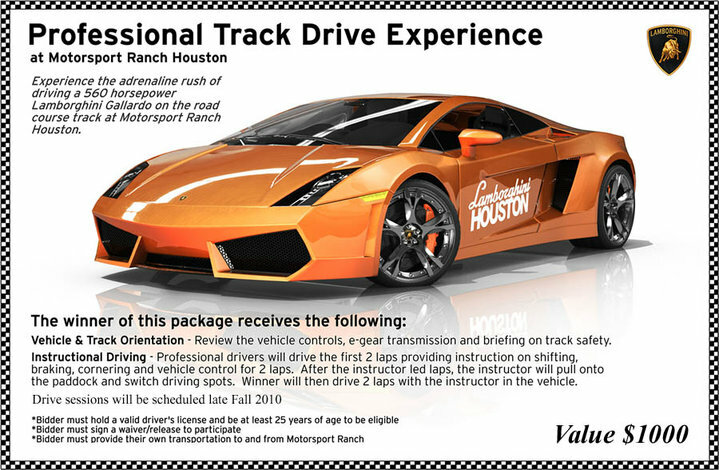 Please join us between the hours of 3pm – 8pm on July 16th in the Macy’s wing of San Jacinto Mall. 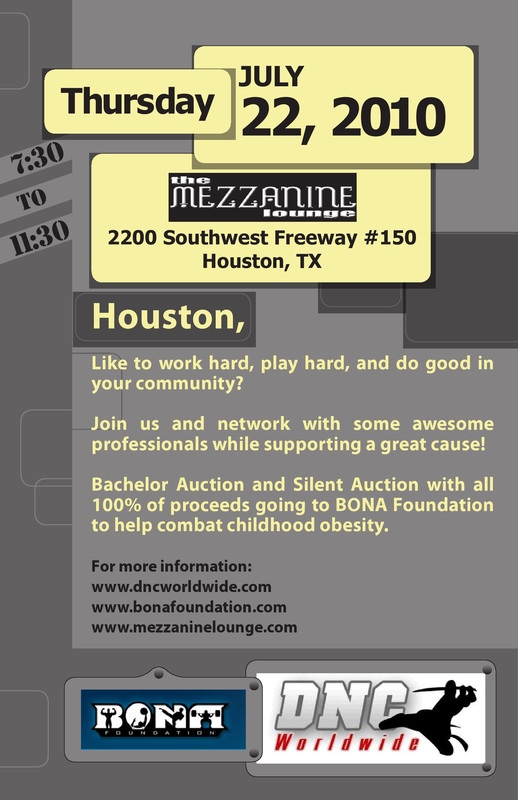 In the spirit of good people helping one another reach greater heights, DNC Worldwide is throwing a networking social and charity benefit on Thursday, July 22nd 2010 at the Mezzanine Lounge – located just inside the loop on the corner of Highway 59 and Sheperd. 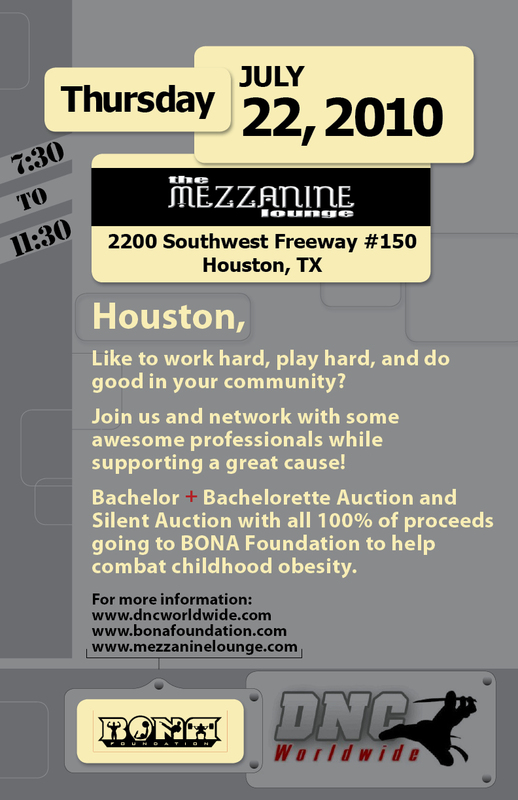 This event will benefit the BONA Foundation, a 501(c)(3) organization that fights childhood obesity and provides scholarships to underprivileged & overweight children across the United States. As a fun way to contribute to this great cause, we will be hosting a BACHELOR AUCTION with some really decent guys participating. There will also be a SILENT AUCTION with plenty of great items and services up for grabs from our very awesome sponsors. 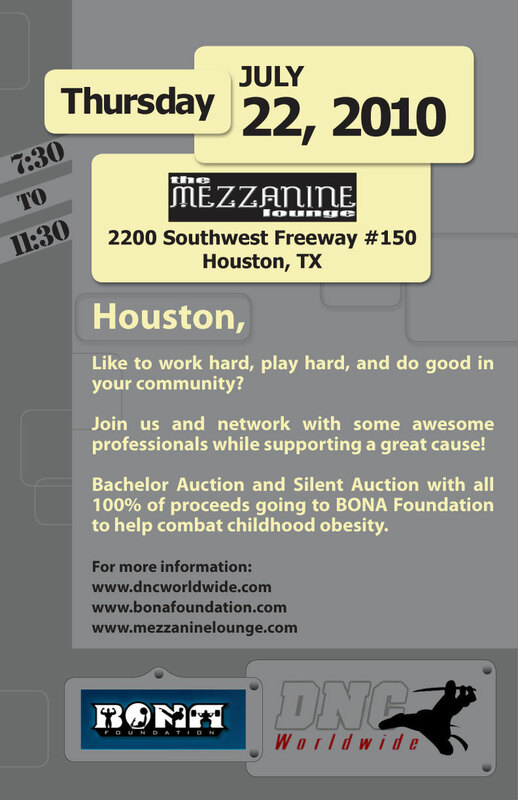 All proceeds will go directly to BONA Foundation in order to help fight childhood obesity. Join us at the Arena Theater as we support two of our own DNC ninjas Jordan Rivas and Ricardo Talavera as they do battle inside the cage! Both these guys are defending undefeated records so look for fireworks. For more info and tickets for this professional Mixed Martial Arts event – Please visit the Legacy FC Website! Note – As a precursor to this event, Legacy Fighting Championships is conducting a school supply drive with the Houston Area Womens Center. School supplies can be dropped of at over 20 different area MMA gyms around Houston. More details on participating gyms and types of supplies needed can be found at http://www.LegacyFights.tv. Congratulations to Mr. & Mrs. Eric Prudhomme on getting married this past weekend! Eric and Sarah’s beautiful wedding took place at Hotel Valencia in San Antonio, TX this past October 3rd with close friends, family, and some of the old school ninjas present to wish the beautiful couple well. Below is a short description of what the wedding was like. Our group of 8 caravan’d over to the San Antonio River Walk’s Hotel Valencia around 7pm. We met the groom and some of his family at the cocktail lounge for drinks and conversation. After a few rounds, we were led up to the 3rd floor courtyard where the wedding was to take place. From the chairs and flower petals to a fire fountain as the backdrop to the altar, the ambience at the ceremony was amazing. The whole scene was chique yet intimate at the same time. With about fifty guests present, the wedding had a very cozy feel. Sarah looked beautiful in her dress. You could see the glow on Eric’s face even before she walked down the aisle. He was lit up with excitement (cheesy grin, ear to ear) throughout their vows and Sarah was bursting with excitement as she proclaimed “absolutely!” in response to their pastor asking if she would take Eric to be her husband. From there, Eric was very ninja as he dipped her for their first kiss as man and wife. After the ceremony, the guests were led to the outdoor patio for a cocktail hour (open bar!) while the wedding party took pictures. The patio overlooked the famed River Walk and was an excellent spot to mingle and chat with friends, albeit the rain that drizzled down towards the end. It was actually perfect timing because as the rain started coming down in earnest, it was time for the reception. Speaking of which, that was absolutely fantastic. The dim lighting coupled with the rose petals adored on the tables and the other decor really set the mood. Someone remarked that the hotel (and reception) were very True Blood-esque and that was definitely true in the sense that the whole engagement was set in style. Substance matched that in the crab cakes, NY strip steaks, crab bisque, and rest of the food which was amazing. The cocktail shots and drinks coupled with dance floor completely sealed it up for what I would say was an marvelous wedding for a similarly perfect couple. The rest of the evening is a blur of Kris dancing with lovely old ladies and a certain someone staggering around the Alamo amidst a torrential downpour so I’ll leave it to those guys to fill in the gaps. Congratulations Eric and Sarah. We love you love you guys! Another one bites the dust. Now here are the pictures from the ninjas’ point of view!